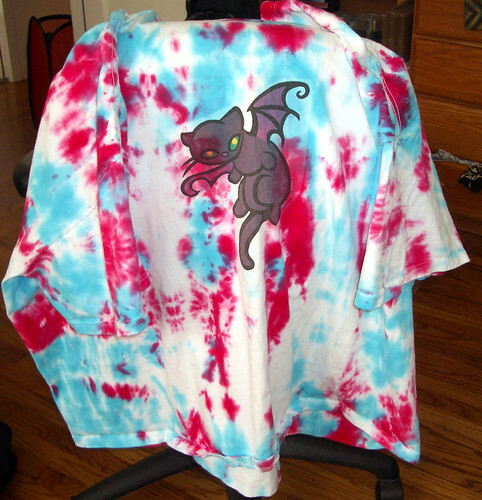 So I embarked on a tie-dye project. Both kits came with rubber gloves and instructions. The first kit, called "Tie-Dye Rope," didn't work out so well. It came with several very small packets of soda ash and some dye-impregnated strings, not really particularly rope-like, more like pencil roving. It was hard to tie the stuff onto the shirts, and since there was only a small amount of soda ash, the dye came out pretty faint. I haven't taken pictures of these shirts. The second kit, Jacquard Funky Far Out Groovy Tie Dye Kit, came with a large packet of soda ash and three squeeze bottles with Procion dye powder in them. The rubber gloves had rotted away while the kit had been sitting around the house, but the rubber bands had not. They were really, really, really sturdy. Using this kit was messy (the squeeze bottles leaked and the dye saturated the fabric and puddled on the plastic) but I was happy with the results. 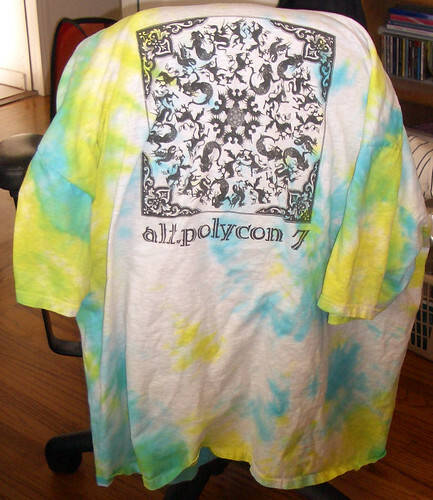 I did three shirts and had dye left over, which I freecycled. I use procion dye when dying silk. It took a bit of experimentation to figure out how to get the best out of 'em (the instructions I had were less than clear on some points), but now I've got the hang of them, I really adore the intense, punchy colours I get with them. Those look good! 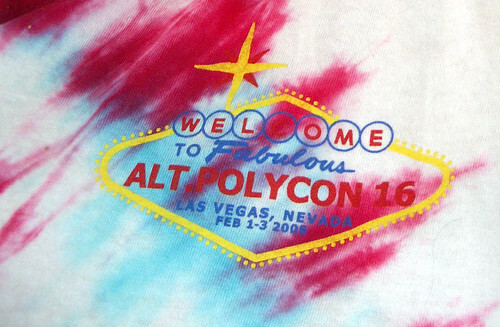 Procion dyes are the only way to go on cotton, rayon, or silk. Russ & I have occasional tie-dye afternoons (or used to, when we had more free time); you can see some of our results here. I'm not seeing any pictures -- am I missing a link? That's verboten. I went to the LJ page, but didn't see links or pictures. I guess maybe it's friends-locked. Good job! Think I could dye white pants with the Procion? How much standing up and strength does it take? Tie dying for me took some standing up (to rinse the clothing under running water after dying) and strength (to twist the clothing and bind it, and to wring it while rinsing). I've done a little tie-dye with the impregnated strings. I ended up not actually using them to tie things, but taped them onto the front of the shirt and then turned the shirt inside out. It worked surprisingly well, though I was doing baby clothes so it may not work as well on an adult-sized piece. I didn't end up figuring out that technique until after I spent most of a baby-clothes-decorating party watching other people have very unsatisfying experiences with them. Thanks! That sounds like a good way to use the impregnated strings. Wow, really cool. Thank you for the idea! I don't like white t-shirts on me either. Thanks! Let me know if you do a tie-dye project.